Hey gang, valkor here. And just when I thought I've seen everything from certain gaming genres, a new company comes out with a product that shows we've barely scratched the surface and that there’s always room for something fun and innovative. 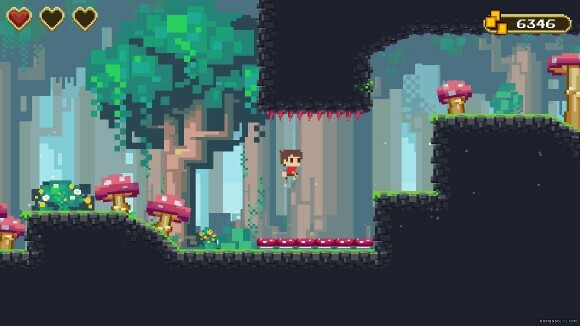 Enter TicToc Games with “Adventures of Pip”, which brings familiar 2D mechanics, while adding their own spin. Does it work or does it flop? Let's dig in and find out. You've all heard the story of a world taken over by the baddies with a lone hero rising from the dust to save the day? 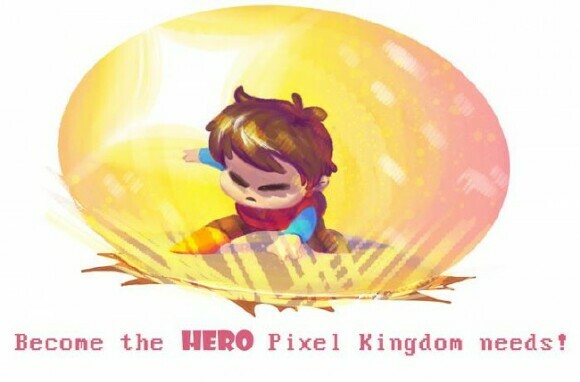 Well the "Adventures of Pip" follows along those same guidelines, except the world he resides is admittedly a world of pixels that doubles as the world's class system - from one pixel (poor) all the way up to fully formed 32bit (rich). 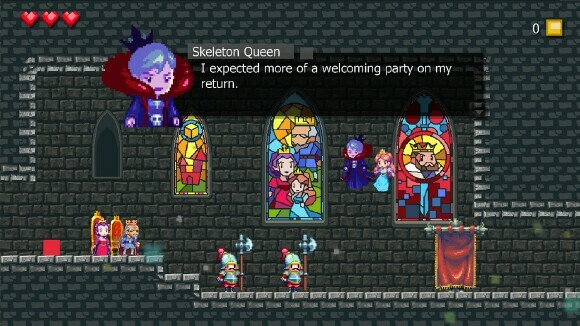 You start out as Pip, a one pixel character who sets out to save his kingdom from the evil Skeleton Queen. 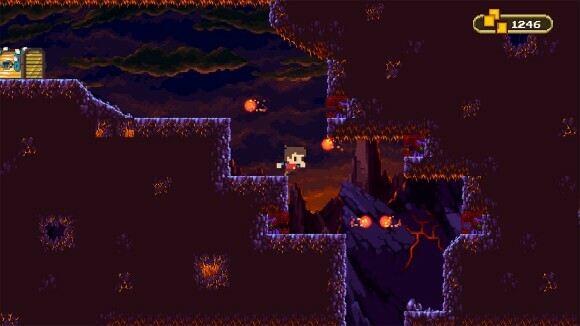 And as a one pixel character, your abilities are limited to bouncing and floating; however by collecting “bit stream energies” from certain enemies, Pip can evolve up to 8 and 32bit (fully realized boy) renditions, each version giving him new abilities at your disposal. At 8bit he can run, wall climb and punch at baddies. And at 32bit Pip can make use of a sword causing more damage. You can't pick and choose when to use these transformations as you’ll need to collect bit stream energies for that. But you can devolve at will, which will get you through some precarious situations. Thankfully, when it comes to the evolution of Pip, bit stream energies are located at appropriate areas. So you'll have to do a little surveying to figure out which transformation is needed and when to make that change. This adds some interesting puzzle elements to the game to break up the normal side-scrolling fare. The enemies you face off against vary from small to ginourmous. Regular enemies can be defeated using your normal attacks or even when you devolve as there’s an explosion that can take them out. The big boss characters can be defeated by following their pattern, which is typical of this style of game. Not only do you have to deal with enemies but also environmental hazards as well. And getting pass all this madness will require you knowing when to choose the correct transformation – and this game will really test your skills in that aspect. 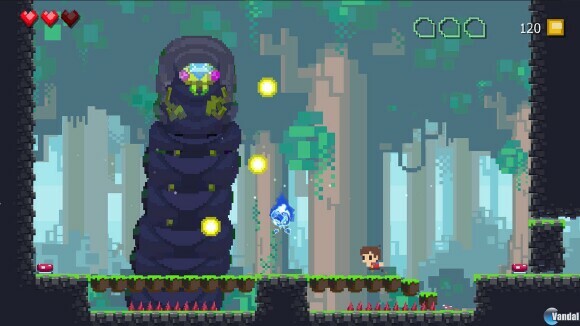 Some will areas will require you pay strict attention such as collecting bit stream energy before falling on a bunch of spikes and floating away in one pixel form, or devolving to destroy a barrier just before you’re squashed like a bug. As you enter each stage, you're also tasked with saving villagers, who will occupy the main town once they’re saved. If you don't rescue them all on the first go, you can always replay the level to go find them if you choose too. Saving villagers will not only supply you with new information (some useful and some not so much), but it'll also opens up shops that may have been previously closed. Once the shop is opened, you can purchase weapons and health items that'll aid you in your progression through the game (even purchasing special items to find the villagers), but raising the money to get said items… sheesh (more on that later). I’m never one to turn down a fantasy adventure, especially of the side-scrolling variety, because I grew up in the 8bit/16bit side-scrolling era; so this is an area I am most comfortable with. 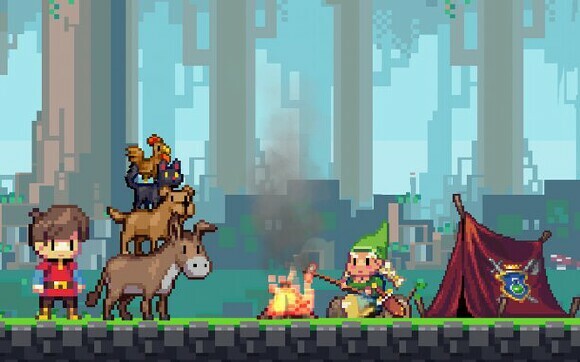 Delving into “Adventures of Pip”, I didn’t know what to expect, with it’s interesting new twist to things, but after spending some time with the game… well I’ll tell you all about it in the TOV Breakdown. 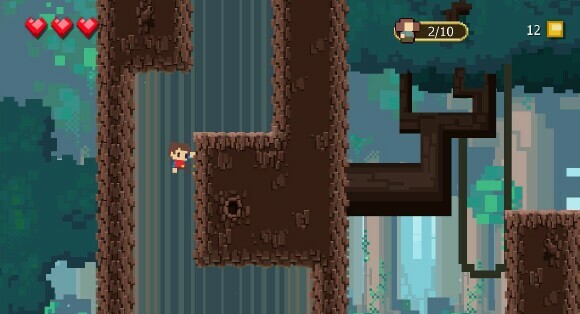 Adventures of Pip is a 2D puzzle/platformer that offers up loads of challenge and fun. The game, on its own, is typical 2D fare akin back to the days of Super Mario World (the further you delve in, the more insane it gets). However playing with the evolution of the character is where the fun is at and it’s oh so entertaining evolving/devolving Pip as it never gets tiring (maybe it’s because of the flashes and sounds accompanied with the transformation). Pip controls well and its typical 2D side-scrolling hop/bop/punch/slash. But it’s all about getting used to his evolve/devolve skill, which isn’t at all complicated. 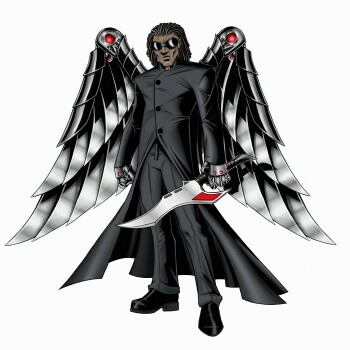 And once you’re used to the mechanics, then it all boils down to when and where you need to use your transformations. The graphics are big, bold and beautiful as it’s the perfect blend of 8 and 32bit graphics in not just the backdrops but also with some of the characters you’ll face. But everything fits seamlessly together, truly immersing you into the experience. The music is also candy to the ears as it’s big and fun and works oh so well as you play onwards. 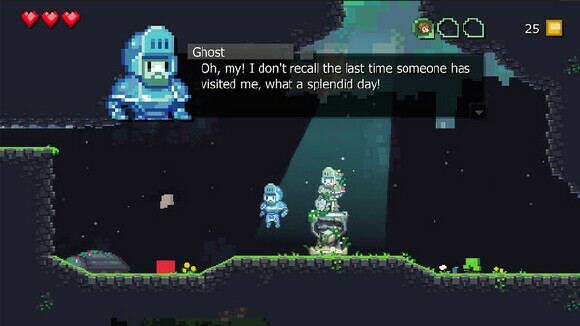 Ultimately I enjoyed my time with Adventures of Pip, which was definitely a unique experience that I’m glad I had the chance to partake. I mentioned above the importance of saving the villagers throughout each level – mainly opening up new shops. The downside to the shops is that everything is rather costly; the financial system is really unbalanced and you can complete the game without buying any of the special items. 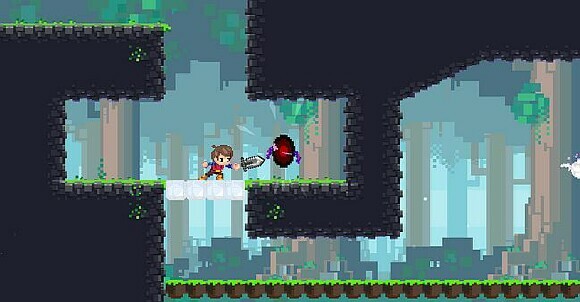 Adventures of Pip is available now for Steam and PC (later on it’ll get the PS4/XBONE treatment); the game is loads of fun and puts an interesting spin on the genre that’s definitely worth checking out. And out of TOV 5 stars, Adventures of Pip gets a solid 3.5. The Bad: Why does everything cost so much?